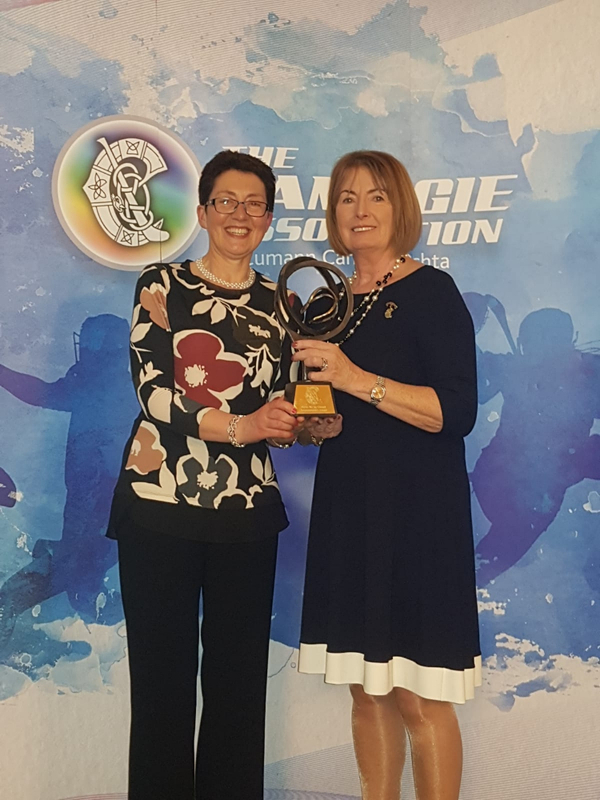 Sheila O'Donohoe of Westmeath was announced as the recipient of the 2019 Síghle Nic an Ultaigh Award at this weekend's Annual Congress in the Shearwater Hotel, Ballinasloe, Co. Galway. Sheila is a member of Drumraney Camogie Club in Westmeath and the CCAO (Waterford Institute of Technology). She has served on the CCAO Council, the National Coaching & Games Committee (current member), All-Stars Committee, Ard Chomhairle as Coaching and Games Representative and her most recent term as Secretary to Ard Chomhairle which she completed at this year’s Congress. In addition, Sheila has served and continues to serve on several other national committees such as the National Development Plan Committee and the Governance Committee. During all of her time on national committees, Sheila has continued to assist & help promote the growth of Camogie in her adopted home of Waterford. Sheila’s most recent activity epitomises her commitment to every level of the game in the running of the Waterford Camogie Under 14 Development Academy. It is rare that she is not present at games of every grade from Club and College to Intercounty. Uachtarán Kathleen Woods presented Sheila with the award at the 2019 Annual Congress Banquet Dinner. From Warrenpoint, Co. Down, Síghle Nic an Ultaigh is credited with guiding the path of Camogie for 50 years. Elected National President in 1949, Síghle served in many roles including Secretary of the Down County Board, Chairperson of Ulster Council, Ard Rúnaí (1953-1975), President of the All-Ireland Primary Schools and Trustee (1985-2004). In 1999 she was honoured with the title of Life President of the Camogie Association. Síghle passed away in the Centenary Year of the Association, 2004, at the age of 88. The Síghle Nic an Ultaigh Award was inaugurated to acknowledge Distinguished Administrators of the Association.